We were saddened to hear of the death of Jonas Mekas, one of the great experimental film makers of the second half of the Twentieth century. 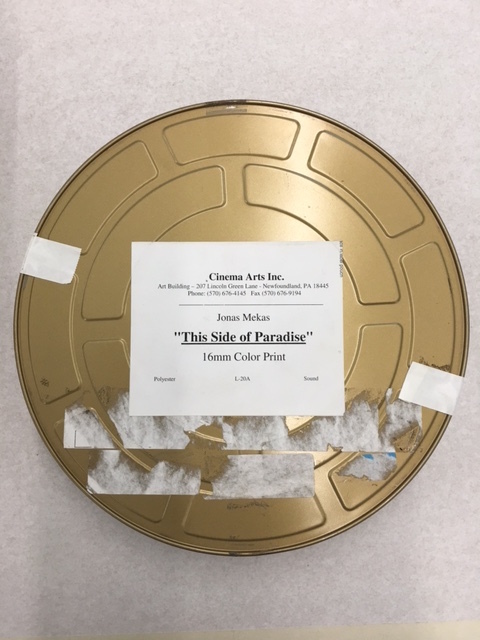 Modern Forms is proud to have the original film of one of Jonas Mekas’ works, This Side of Paradise in its collection. The film was shot whilst Mekas spent time with Jackie Kennedy and her sister’s family and children in the years following JFK’s death. He and the members of the Kennedy family shot the footage over several summers in the late 60’s whilst on holiday in Montauk, where they stayed in a house rented from Andy Warhol. Mekas finished editing the footage into a film in the late 1990’s and released the film in 1999. The film is a beautiful, gentle, experimentally Modernist take on the home movie, that in retrospect, unwittingly seems to anticipate the celebrity obsessed culture and revelatory culture of social media and reality TV. As time went, Jackie found time to see my own, and some other avant-garde films. She especially loved Walden: Diaries, Notes and Sketches and she chose Reminiscences of a Journey to Lithuania to show to all her relatives on one of the Mother day’s.